First of all, Casa Miglis welcomes all old and new costumers back from the vacations. We are proud to present some new fresh dishes on our meny. The summer has been very interesting for us and Mr. Miglis won 1st price with his film “El Medico-The Cubaton Story” in NY Latino Film Festival in Agust that treat his work with music and film in Cuba the last 15-years. This has put much focus on the restaurant and we hope that a lot of new clients from all over the world will come and visit us this season, curious to meet in Miglis bar and hear the “true” stories, now as the film will start to have premieres around the globe. Again, very welcome back to us. Michel Miglis came to Cuba 1996 to film an interview with Ernest Hemmingway’s shipper Gregorious Fuentes that in real life was the man that got the fish in the book “The Old Man and The Sea”. 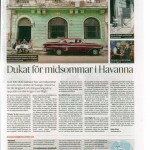 Mr Miglis is a swedish film director/ music producer and from that first trip he fell in love with Cuba. Michel has done a lot of famous music videos in the island with world artists like: A-Teens, Dr Alban, Arash, Lumee Dee, Tatoo, Teddy Bears, Ceasars Palace. 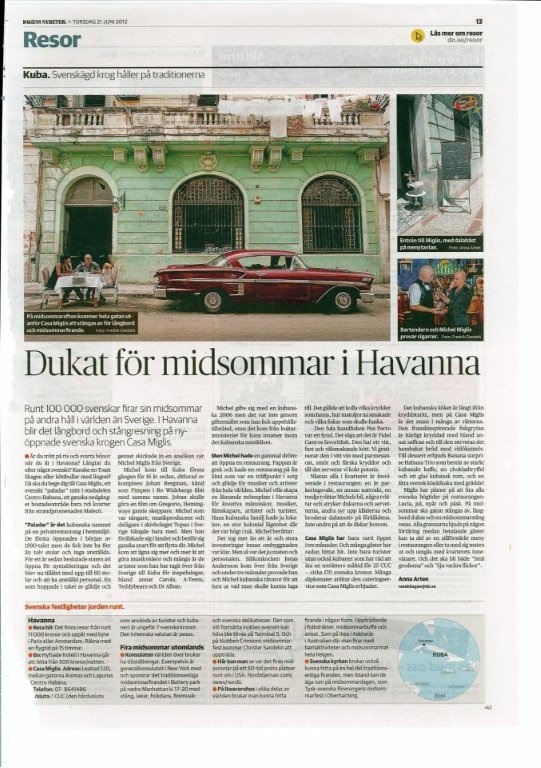 In Cuba Mr Miglis has been working a lot in the culture area. One of the biggest projects in Cuba is the “Cubaton” project including a lot of music productions and a full length movie released on the cinemas worldwide 2012/13. Mr Miglis father is from Greece, Rhodos and his family has a restaurant and Bar there since 1962. Casa Miglis is an old dream coming true that has been realized together with Michels Cuban family that he got true his marriage with his Cuban wife 2005. One of the main goals with Restaurant Casa Miglis and its bar “Impala” is to create a meeting point for creative people and artists from all over the world. 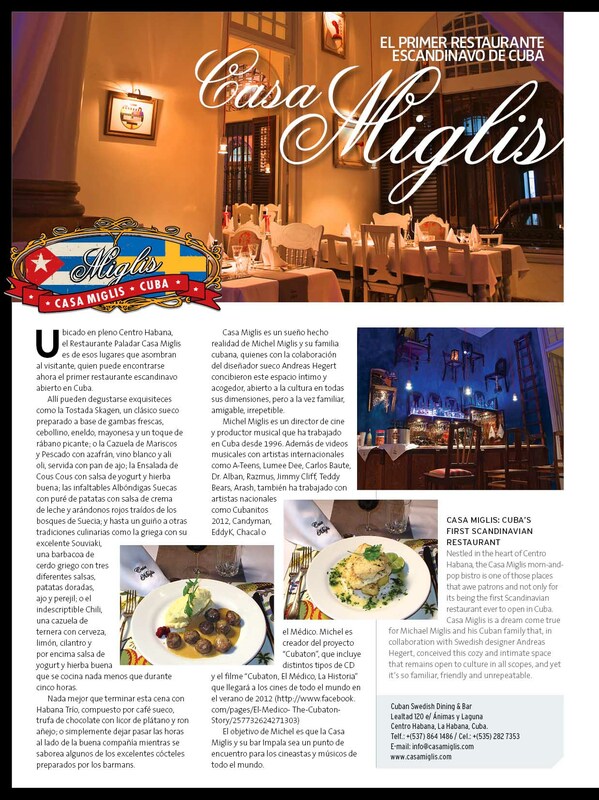 Casa Miglis represents what Swedish people eat today and its menu is designed by the Swedish cook Jonas Anderson. 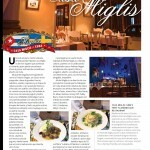 BEST RESTAURANT IN CENTRO HAVANA!!!! Choosen by the important site Cuba Aabsolutely. 6 STARS in food. We are very, very proud.